Industrial Noise indoors and outdoors with Noise Transmission. The SoundPLAN industrial noise modeling is unique. All questions of frequency dependant noise can be simulated whether it is purely an indoor problem, a receiver outside that needs to be assessed for outside sources, or a complex problem with the source inside an industrial building and a receiver on another building. The simulations inside industrial buildings are completely integrated with the transmission through the outer walls and the propagation into the environment. Sources for the industrial model can vary between point, line and area sources. The sources can be described with the sound power [Lw] (for a mean frequency, octave or third octave band), with a 2D or 3D directivity and with a time history defining the strength of the source within the 24 hours of the day. Routines to convert sound pressure levels with a given reference distance into sound power and frequency filters are part of the SoundPLAN tools. For line and area sources, the sound power can be entered for the entire source (as per unit) or as a power per meter/square meter of the source. An excavator in a construction site is a perfect example of a per unit area source. Per meter is a sensible entry for a conveyor belt that emits a certain sound power every meter of its length, whereas the per unit setting would be preferred for a fork lifter with a known sound power that is moving along a defined path. SoundPLAN is a standards based software system offering industrial noise calculations in accordance to all known international standards. The calculations for indoor noise problems are based on the VDI 3760. Although all standards for industry noise intend to simulate the propagation of noise from a source to a receiver (described by sound power, frequencies, directivity and hourly history), they are each unique. There are differences in what is simulated and how the physical parameters of the transmission path are described. Some of the standards intend to give the worst case answer (i.e. simulate a down wind situation or slight morning inversion conditions), some intend to simulate the annual average conditions, and some specialize in describing the momentary situation with wind and weather of current conditions. Episodes with multiple weather scenarios linked together can form annual average conditions. Please read each standard text carefully in order to understand the intent of each particular standard. For describing the physics, there are 3 basic models. Some of the models share very similar parts with small, but important variations. VDI 2714/2720, the General Prediction Method for Industrial Plants, OEAL28 and the ISO9613 with variations share the same roots and concepts. CONCAWE was designed to simulate the propagation for a specific weather scenario. It was derived from measured data and uses 3rd order polynomials to describe the effects of wind, stability and ground effect. Unfortunately, these formulas all loose their validity below 100 meters. SoundPLAN uses the formulas, but derives answers for closer sources by linear interpolation of the value calculated at 100 meters. The new Nord 2000 uses new concepts and features a phase correct reflection of the wave on the ground. A frequency dependant Fresnel Ellipsoid marks the influence zone for the propagation. Every object inside this zone has an influence on the results. Because of this, simple cross-sections are no longer useful for describing the propagation path. 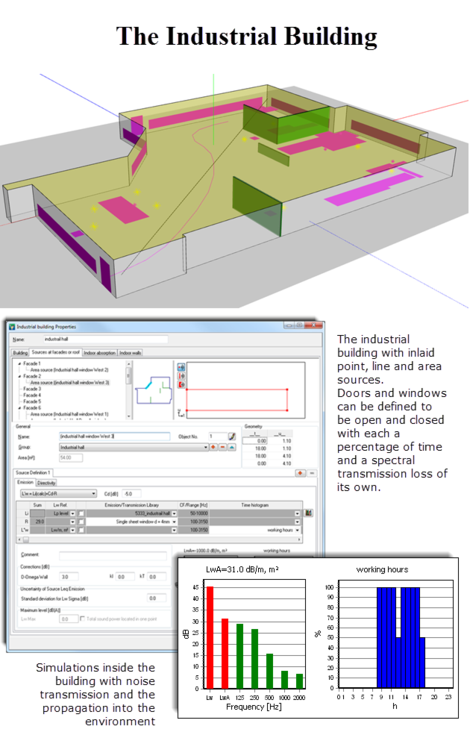 The industrial building is a core element of the industrial noise modeling suite. This object is used for both indoor and outdoor simulations. Freestanding point, line and area sources are the second object type used to define industrial sources. Both types can be used in combination. Regardless if the indoor noise levels are guessed, measured or simulated, the industrial building is the entry point for the outdoor simulation. In the picture to the left, the industrial building shows sources superimposed on the sides. These are the windows. They are subjected to the same indoor noise levels, but have a different transmission loss. By embedding the sources on the industrial building, SoundPLAN can work with correct spectral sound power and source size information. This is much more transparent than working with differential sources. 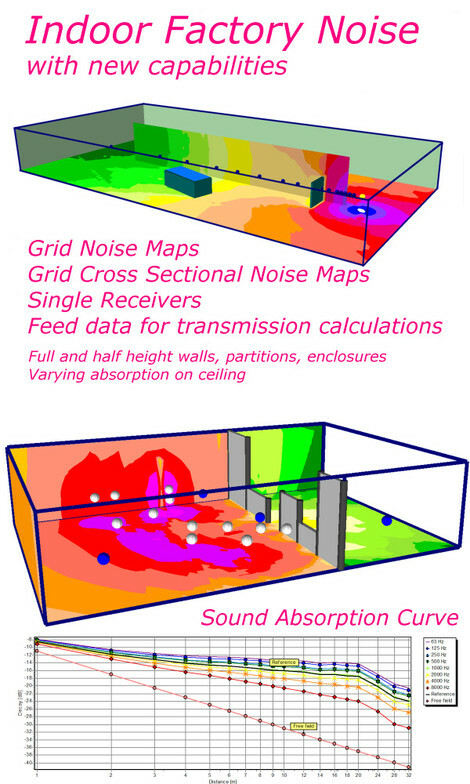 SoundPLAN has a unique coupling of the noise simulation indoors and the propagation into the environment. All components are integrated into the same suite, making it possible to enter the simulations at many points and to extract results for various situations. Noise simulation indoors for determining locations where workers need hearing protection. The acoustical quality is not the issue here, only the position of the 85 dB contour counts. Noise simulation for the purpose of improving the acoustics environment in a room (i.e. an office where a certain maximum noise level shall not be exceeded in order to assure the space is valid as an office or call center, etc). Simulation of the acoustical environment of enclosed very loud aggregates. For this situation, the noise levels inside can be determined by measurements, or the future noise levels can also be simulated in the planning process. 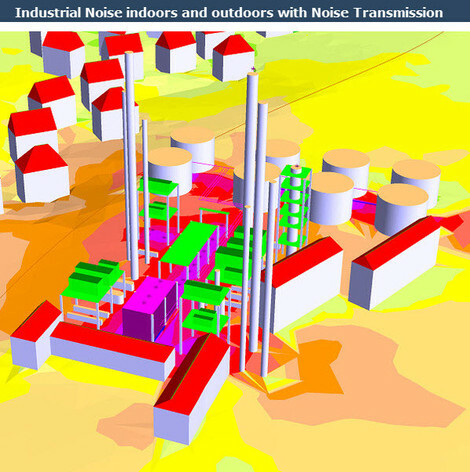 Noise transmission in industrial plants with coupled rooms where the transmission from one workspace to another can make it difficult to find a quiet area for administrative tasks. Finding the correct enclosures for operators by simulating different transmission losses for walls, doors and windows of the enclosure. Assessing room acoustics by determining the reverberation time over frequency. The sound decay curve in the room is a suitable measure for this. The full integration of the room acoustics simulations with the indoor noise, transmission and propagation into the environment, is unique to SoundPLAN. It is centered around the industrial building, an example of which you see to the left. The geometry of the industrial building allows any floor plan. The only restriction is that the roof of the building must be parallel to the floor. More complex roof structures need to be approximated at this time. The VDI 3760 delivers the basic formulas for the indoor noise modeling. The model is very easy for the data entry. After defining the outside walls and half and full height partition walls, the internal scatter in the hall needs to be described in terms of absorption areas. It is not needed to declare the exact location of absorptive surfaces; the total area and an average absorption coefficient is sufficient. The calculation procedure simulates the noise field by assessing the direct source to receiver transmission and then simulates the reflections on the walls, ceiling, floor and the partition walls. The diffuse noise field is added by assessing the room size, the area size, and the absorption coefficients of all scattering objects. The formulas and further descriptions can be reviewed in the handbook, which is available in the download section of the website. Chlick here for more information about the Indoor Noise model. Noisy sites setting alarm bells ringing? No reviews were found for SoundPLAN - Industrial Noise Indoors and Outdoors Module. Be the first to review!